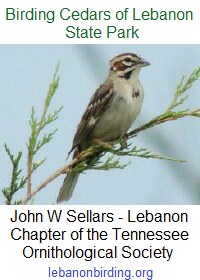 The second class of the Tennessee Naturalist Program at Cedars of Lebanon State Park, Geology & Ecology, will be held Saturday, 9 January 2016 at Cabin #13. Once you enter the park through the main entrance continue on past the park office on your right. When you come to the split in the road, bear to the right onto W.P.A. Road. You will cross over 2 or 3 speed bumps then come to a gravel drive on your left. (at the playground across from the Assembly Hall). If you cross the bridge you have gone too far. Turn left on to the gravel drive and #13 will be the first cabin on the right. The class will begin at 9:00 AM but please arrive before 9:00 AM to insure starting on time. Also, remember to bring your lunch with you. What you will need: pen or pencil, snacks, drinks, and a bag lunch. If you have any further questions please feel free to contact me Emily Howard via e-mail at Emily.M.Howard@tn.gov or giving her or Ranger Bill Loewer a call at the main park office at 615-443-2769.